All nations are talking about the storm of Smart Manufacturing / IOT / Industry 4.0. Classical models of manufacturing and business are giving way too much more collaborative, self-aware, innovative and productive techniques, using data sourced directly from sensors, machines, vendors and customers. This has a direct impact on competitiveness and quality of goods and services of an enterprise. Samarth Udyog is the goal of the Indian Manufacturing Ecosystem and is achievable in a manner that works for you. To strengthen the ‘Make in India’ eco-system with adoption of smart technologies, the Automation Industry Association and IIT Delhi have created a Special Purpose Vehicle, called the Foundation for Smart Manufacturing (FSM) to take the emerging wave of Smart Technologies and adapt it with relevance to the needs of grass root manufacturing in MSME and talent incubators in Educational and Vocational Institutes. Delivering consistent quality backed by stringent norms through the production and manufacturing pipeline, right from raw material sourcing to finished product delivery for the quality conscious end user, it is essential that Indian industry aligns itself towards adopting newer and tested quality assurance practices. To facilitate, introduce and enlighten industry with an evolved genre of quality focused smart manufacturing, Quality Council of India supported by IITD-AIA Foundation for Smart Manufacturing conducted an awareness workshop with hands-on exposure in the FSM Cyber Physical Laboratory. 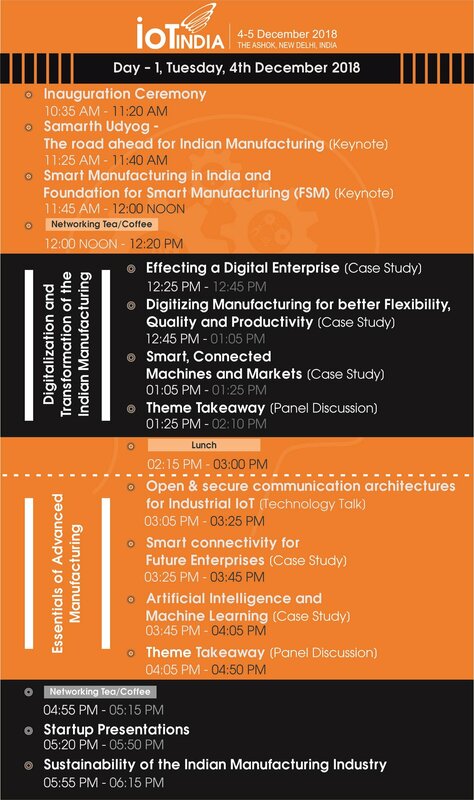 Inaugural Theme: Global Smart Manufacturing Scenario and Implications for India - Manufacturing industry is responding to consumer and environment demands with a high degree of technological innovation that is being fuelled by the rapid convergence of Information and Automation processes. The competitive equation is no longer determined by low wages. It is being replaced by speed, flexibility and first-time right abilities. Technical Theme - 1: Role of Sensors, Human-Machine Interaction, Precision Control in the Quality Journey - Quality assurance is largely a function of the material processing and inspection functions, whereas cost competitiveness is largely a function of idle time reduction and waste elimination. Sensors are the 24*7 watchdogs, measuring every minute aspect of operation. Information that is relevant for automated control is passed on to PLCs or Servos, whereas information to alert and guide plant personnel is presented via appropriate Human-Machine interface devices. 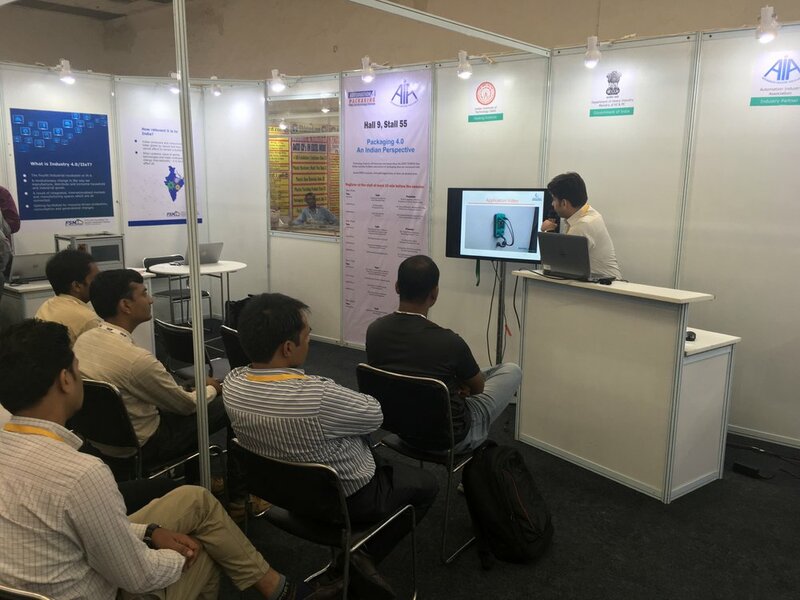 This session was aimed at helping participants understand the various classifications of Sensors, HMIs and Control Systems used in modern machineries. Lab Session - 2: Familiarisation with Collaborative, Digital, Engineering and Asset Management Tools - This session offered a live demonstration of software tools and cloud-based services. With the help of simple case studies, participants experienced how physical components are converted into ‘digital’ format and presented for human collaboration. Among the tools demonstrated were 3D Visualisation, Augmented Reality and Real-time Analytics. Technical Theme - 2: Demystifying the Digital Thread and ‘Anywhere’ Data - Possibilities of Cyber Physical integration are increasing rapidly because of the rapid deployment of cloud based digital platforms. It is now possible for people to collaborate sitting far away from each other. This session helped participants differentiate general IoT platforms with IIoT platforms. Covering relevant digital services for manufacturing such as deployment of Augmented Reality and Analytics. Panel Discussion Theme: Organisation Assessment and Road Map for Samarth Udyog / Smart Factory - The indicators of ‘Samarth Udyog’ or Smart Factory presented by panelists and were discussed in an open house format. 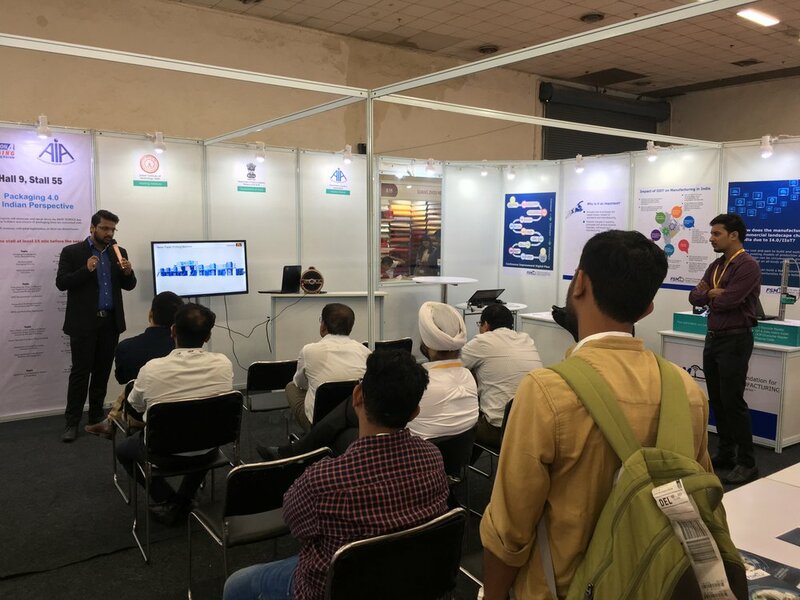 This session was aimed at providing participants an opportunity to explore a few relevant steps they can initiate in their existing roles, to prepare for the journey into Smart Manufacturing. Participants who attended this programme reported receiving a balanced view of the fundamental shifts taking place relevant to the Indian ecosystem. A consequence of being exposed to the possibilities of ‘Digitalisation’ - its benefits as well as key challenges involved. Enlightened with a basic framework of readiness for Industry 4.0. While participants who had their internal systems and budgets already set for improving quality and transparency were guided by experts and encouraged towards identifying teams, technologies and detailed engineering needs for conducting proof-of-concept activity. The “Digital” storm and the manufacturing world is agog with the rapid changes that are transforming the international manufacturing scenario. Technology is forcing huge disruptions in the classical models of global commerce. India being one of the biggest markets in the world with an equally strong bedrock of potential in manufacturing, cannot stay aloof from these winds of change which are forcing readjustment of the sails elsewhere. Samarth Udyog is an initiative by the Government of India that bridges the awareness and actual technology gap to enable Indian companies to participate and play an important role on the global stage of manufacturing. 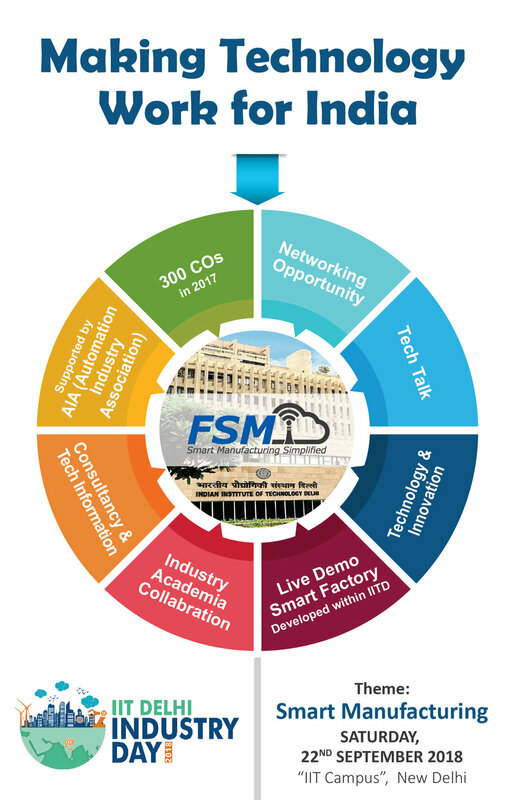 To strengthen the ‘Make in India’ eco-system with adoption of smart technologies, Industry and IIT Delhi have created a Special Purpose Vehicle, called the Foundation for Smart Manufacturing (FSM) to take the emerging wave of Smart Technologies and adapt it with relevance to the needs of grass root manufacturing in MSME and talent incubators in Educational and Vocational Institutes. Addressing Challenges ahead of Samarth Udyog,Mr. Raj Singh Rathee, Managing Director, Kuka India Pvt Ltd.
Mr. Arun Kapur, Chief Operating Officer, Luxor International Pvt Ltd.
Mr. Sunil Mehta, General Manager, Mitsubishi Electric India Pvt. Ltd. Intelligent Conveyor Technologies for Industry4.0 Factory– Mr. PV Sivaram, Chairman Emeritus, B&R Industrial Automation Pvt Ltd.
Smart Sensing Solutions for Samarth Udyog – Mr Ravi Agarwal, Managing Director, Pepperl+Fuchs Factory Automation Pvt Ltd.
Packaging machines are a vital part of the production process in the consumer goods industry. They often work in multi-shift operation, and any malfunctions have to be met with a fast response. Packaging 4.0, held in the fourth week of July offered an open forum for the Indian Packaging Machinery Suppliers and End Users. 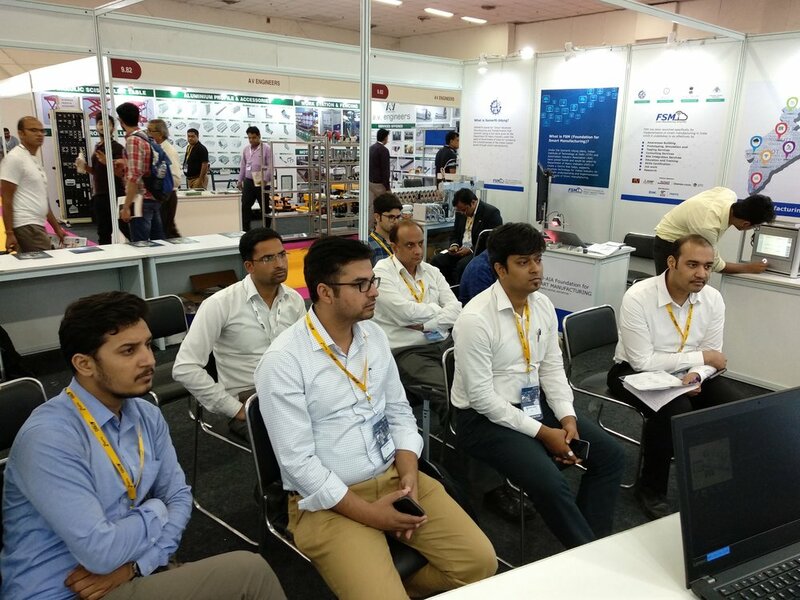 At the Smart Manufacturing Pavilion, Technology Experts showcased and spoke about HOT TOPICS, those that Indian machine builders and owners of packaging lines are concerned with. Pepperl+Fuchs Factory Automation India Pvt. Ltd.
Parametric Technology (India) Pvt. 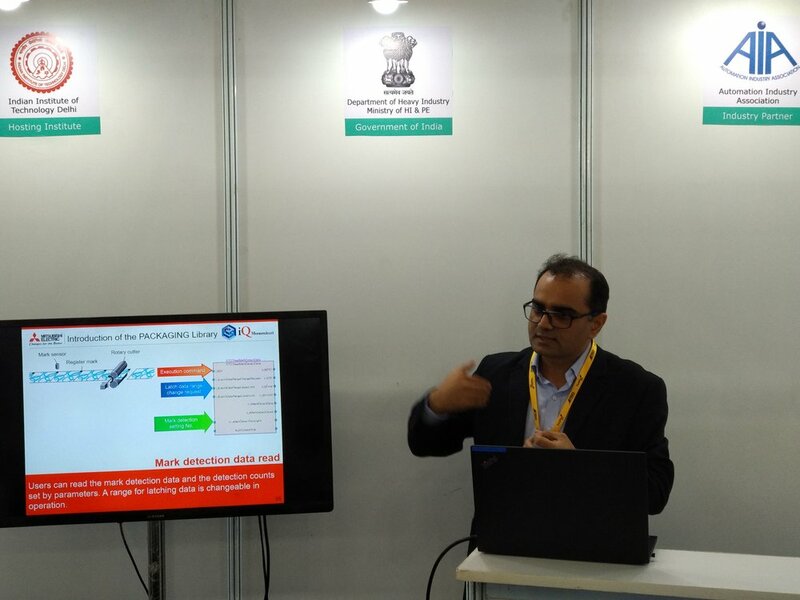 Ltd.
Anup Wadhwa presented 'Building Country Capability to Leverage the Potential of Cyber Physical Intelligence' at the ARC Forum 2018. P.V. Sivaram presented "Industrie 4.0 - Way Forward in India” at the ARC forum in 2017. In partnership with Hanover Milano Fairs India Pvt. 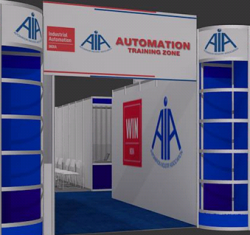 Ltd. AIA set up an exclusive Zone during WIN India 2016 at MMRDA Grounds, Mumbai with an ultimate objective of training PEOPLE in advanced technologies to make them competent in solving operational issues and contribute to the superior performance and real-time management of plant, machinery and associated resources. Automation Industry Association (AIA) founded in 2004, is India’s apex automation industry body, with nearly 40 high tech automation companies. The technologies they represent encompass electrical automation, mechanical automation, continuous and batch process automation, robotics, machine vision, assembly and material handling systems, sensors, controllers, actuators, communication devices, HMI, real-time software, simulation, training, and a host of interface and supporting sub-systems. It has pioneered the vendor-neutral approach in developing Educational Curriculum for Universities and is promoting Industry Practices and Skills consonant with Global Standards. Staff from Maintenance / Projects / Utilities / Safety / Machine Design / Production Systems Design / Quality Management - participated in the training in their chosen domains and conducted specific mini-experiments with their own hands. At every training booth, there were industry-standard, hardware and software components, configured for demonstration of the concept and the participant exercises. Pack Plus Exhibition at Hall 12 A Stall 40, Pragati Maidan, New Delhi. Packaging machines are a vital part of the production process in the consumer goods industry. They often work in multi-shift operation, and any malfunctions have to be met with a fast response. Packaging 4.0 is an open forum for the Indian Packaging Machinery Suppliers and End Users. Packaging 4.0 – India Perspective represents the shift towards new wave automation technologies that provide clear diagnostic and remedial strategies. 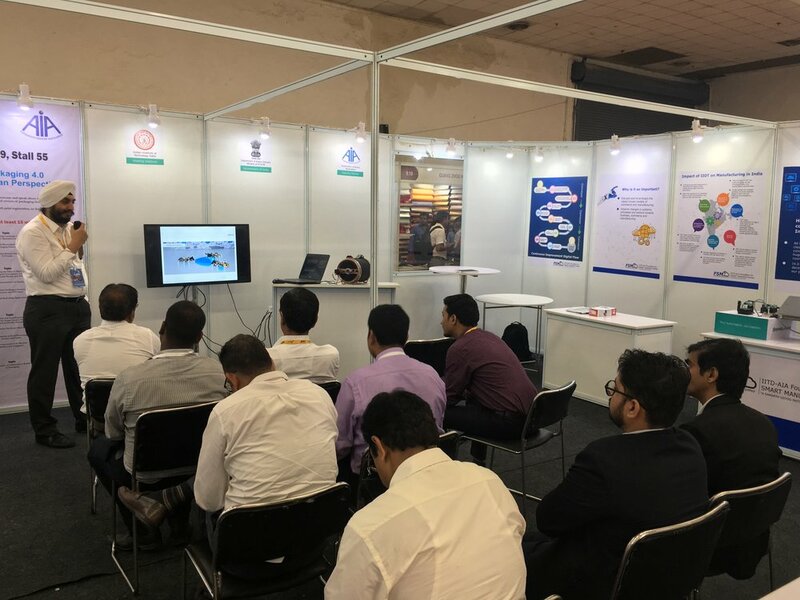 At the Automation Pavilion, Automation leaders showcased and spoke about the HOT TOPICS that Indian machine builders and buyers of integrated lines are concerned with. Automation Industry Association (AIA) founded in 2004, is India’s apex automation industry body, with nearly 40 high tech automation companies. It has pioneered the Integrated Automation approach in the Educational Curriculum for Universities and is also promoting Integrated Automation Practices and Skills consonant with emerging global trends. Packaging 4.0 is an open forum for the Indian Packaging Machinery Suppliers and End Users. P. V Sivaram presented “Industry in Transition: Navigating the New Age of Innovation - AIA Perspective” at the ARC forum in 2016. The 'Smart Automation for SMEs' Conference was held on 10th September 2015 that showcased how SMEs can bridge quality gaps, sustain long lived performance, master the skills needed to absorb required levels of Industrial Automation and become partners in global supply chains. Mr Dilip Sawhney, delivered the keynote address on the theme, 'India Specific Challenges'. Manufacturing is acknowledged as a developing country's stable engine for economic growth. For the economy to grow, manufacturing vision must be fuelled by innovative and creative leaders, said DrKalam, at a recent forum of Automation industry leaders. Manufacturing companies looking for sustainable competitive solutions can draw inspiration from that vision. In an era where reduced budgets limit the scope for trials and error, Automation Tech 2013 served a timely reminder for manufacturing leaders to be future ready. On Friday, the 18th October, the link between Manufacturing Competitiveness and Automation was explored at the Automation Tech Conclave, organised by AIA in Pune. Nidamaluri Nagesh, a recipient of the prestigious Boss Kettering Award for Innovation on Collaborative Robots and currently Sr GM with Mahindra Vehicles, dealt with Automation Game Changers, Connected Manufacturing and Disruptive technology. Quoting a Gartner report, Nagesh emphasized "Over 50% of internet connections in the PLANT are THINGS. Manufacturers need a fully connected enterprise to compete in today’s global economy. They need to connect their manufacturing operations and business systems while sharing performance data with machine builders and tier suppliers to improve processes, increase production and reduce risk. At Autom@tion 2013, global technology giants like Microsoft, Rockwell Automation and Siemens also pitched in with their sneak previews of future automation technologies. To sum up, Autom@tion Tech really showed how Automation is a hidden value amplifier and how manufacturing businesses can unlock profit potential with real-time decision power. AIA also launched its news magazine, Automation India, introduced as an open and collaborative forum to share unique experiences and challenges. In the current market scenario, automotive manufacturers and their supply chain partners, are experiencing swings in market demand, that pose a special challenge for sustainable growth. Manufacturers envision a flexible setup that is cost competitive, yet capable of rapid multi model adjustments. This strategy translates into 4 specific goals that manufacturing engineers, production engineers, shop floor staff and automation engineers can collectively pursue. Innovation for flexible manufacturing that can cater to changing model demands from the market & also should be easily adaptable to manufacture new models & variants. Innovation for sustainable process improvements based on real-time tracking & tracing to achieve manufacturing transparency & reduce waste in manufacturing. Innovation for sustainable Energy Efficiency and recycling, in manufacturing processes. Innovation for improving the Safety & Environment standards that motivates a new generation workforce. Based on the innovation strengths of in-house teams, we receive small to mid-sized projects the Industry. This year the AIA team received nearly 40 cases which were evaluated, All leaders selected for felicitation will also be supported by AIA and its member companies in pursuing further experimentation and innovation. The Innovation Exchange Programmes at IATF 2013 were spread over all 3 days, giving importance to different facets of the automation sector. The inaugural session saw eminent leaders come together and share their vision for automation industry being a catalyst for the growth of Indian economy. Day 1 and Day 2 panel discussions highlighted technical themes that made an impact on project success and sustainability. Day 3 was about innovation at the grassroots, with focus on SMEs and young people. Great Lakes Institute of Energy Management and Research Gurgaon. Eminent experts from the Automation Industry have shared their success stories, insights and inspiration with leaders in the Manufacturing Industry. The conference was held as a concurrent event of the India Manufacturing Show . The manufacturing industry, as the backbone that defined India’s growth in the 1980-90s. While India gained global prominence due to the rapid growth of the service Industry, the manufacturing industry has all the qualities to further enhance the economic development of the country. In fact, it is this sector that is fueling growth, employment and enhancing the other industries such as agriculture and service. To accelerate the efficiency and competitive performance of the manufacturing industry, it is essential to modernise their infrastructure. Now more than ever before, industrial enterprises and utilities rely on their control systems to improve their reliability and efficiency. Automated, Flexible, Synchronised and Efficient Production Systems are in demand to execute innovative business strategies and sustainable operational practices in manufacturing and improve value for the ecosystem. Industrial Automation is the emerging technology infrastructure for a robust and sustainable economy. An Automation Product development case study, by Jayendran Balasubramanian, MD, Nextfirst Engineering. A concluding Panel Discussion, chaired by Uma Balakrishnan, Co-Founder & CEO, Axcend Automation and Executive Council Member, AIA. The AIA President delivered the keynote address at the ARC Forum on July 6, at Hyderabad on the theme, 'Transforming Industry and Infrastructure'. In today’s competitive market, the company that stands out is the one which has been able to use technology in a creative and innovative way. This event was an effort, recognized how automotive middle-level management equivalent of plant managers and general managers created excellence through innovation in their plants. In keeping with the overall theme of “Manufacturing Excellence”, on Day-2, this sub-event was aimed to celebrate the achievements and experience of plant managers using Automation creatively in their manufacturing processes. This event had provided a forum where seasoned automotive specialists can engage in an exchange of ideas with each other; aknowledge sharing opportunity. Managers from across the automotive manufacturing spectrum have had the opportunity for their hard work and creative passion recognized and celebrated. Format- These managers had presented their experiences in Quality, Safety, Energy Efficiency, Environment Protection, Productivity and Value Improvement etc and illustrated with examples how they have creatively used Automation in true-life situations or have overcome some specific challenges with technical creativity enhancing plant performance and efficiency. Regional Director, Rockwell Automation India Pvt. Ltd.
About 100 attendees from the region’s major user groups - OEM, Tier 1 vendors, system integrators, and machine builders were there, making it a great place for networking, sharing ideas, celebrating success, building relationships and learning about developing initiatives. The program’s collaborative nature enabled the participants also to learn from one another. It aimed to create a motivating environment and built credibility and profile. Boost your profile – The program is an excellent means of raising individual as well as company profiles. Awardees and winners receive widespread media coverage about their achievements. Establish credibility – This is the chance to prove that you and your company are worthy of competing on the world stage. The AIA President, Mr V. V. Paranjape delivered the keynote address at the ARC Forum on August 2nd, at Pune, addressing the theme 'Gaining Sustainable Competitiveness and Achieving Operational Excellence. ', Mr Paranjape focussed on the Digital Manufacturing Vision, its impact and challenges. India’s automotive, auto components, and machinery industries, which are poised to post robust growths in the years to come, have opportunities to emerge as best-in-class. While domestic demand drives industries’ growth, their challenge is protecting their margins and gaining global competitiveness. The entire Design-Operate-Maintain cycle will need to be continuously addressed to discover newer ways to delight consumers and gain competitiveness. There is a constant need to channel investments into systems and solutions and adopt best global industry practices in order that greater operational performance levels are achieved. Shortening design and engineering cycle times is critical to reducing manufacturing costs, which essentially means reduced iterative actions necessary to design, manufacture, and deliver products to consumers. Manufacturers will need to invest in technologies and solutions leveraging digital manufacturing, third-party product engineering services, and collaborative production management (CPM/MES) systems, backed up by state-of-the-art factory automation, and supply chain and product life cycle management systems. OEMs must have state-of-the-art plant-floor automation systems and integrate them with enterprise and other decision support systems. Turck India Automation Pvt. Ltd. Helping Vehicle and Auto-component companies deploy appropriate technology and connect to providers of systems and processes to optimize efficiency, quality and costs. ‘SME India Outlook 2011’ has disclosed the opportunities that Small & Medium Enterprises (SMEs) in India can leverage for operational excellence, through smart IT & Automation technologies. AIA was a knowledge partner for this event. AIA members serving the SME sector were invited to participate and showcase best fit technologies and solutions. A Thought Leadership Discussion was held on 17th May 2010, the concluding day of the Automotive Engineering Show at Chennai. The panel comprised Manish Ramakrishnan, Sr. Manager, Ashok Leyland, Satish Ansingkar, Vice President Sales, B&R Industrial Automation, Jitendrakumar Kataria, MD, Beckhoff Automation Pvt Ltd and Sudhir Bachloo, Sr. Manager Automotive (Business Development) Siemens Ltd. The discussion was moderated by Anup Wadhwa, Director, AIA. The evolution of Automation technologies has gained considerable momentum over the last decade, giving rise to a host of new hardware and software features. Is India’s Automotive Industry at par with the developed world, in the deployment of Automation? It seems both sides are not satisfied with the current gaps in the engagement process. Are we stuck with an entrenched practice or is there an alternate approach to look at? The adaptation in India is slower. There is fear about being able to deploy fast changing technologies. People training is yet to become a high priority, so the necessary ground work needs to be laid at the college level itself. Real-time Factory Automation is yet to emerge as a full-blooded engineering discipline. There are a very large number of automation vendors coming to meet us; which is a good sign, but what they are selling is technology in isolation. We would like to see sales teams sit with us at the design level and show us exact deployment. There are independent hardware suppliers, machine builders and integrators They respond to unconnected specifications and acceptance procedures. Very often the different entities within a supply chain operate completely independent of the main OEM while determining the specifications of Automation investment. We welcome more discussions on application needs before the commercial dialogue. The wish list for us would be to maintain our assets in good shape for achieving High Line Throughput, Multiple Model Flexibility, Total Cost Reduction, Technology absorption and skill upgrade. If we can do all this we get to be very competitive. Better visualisation is useful. Safety integrated into controllers are very important. RFID applications are being used in axle and engine making lines for automated tool selections. But RFID based tracking in assembly operations is still under evaluation. Wireless and mobile HMIs are going to increasing operator convenience. And if genealogy is to be captured with read / write operations, or if tagged items have to pass through high temperature zones, RFID is increasingly becoming relevant. The focus of the 1st International Automotive Engineering Show at Auto Cluster Exhibition was on enabling technologies for manufacturing. Mr JK Verma, who leads the Automotive interest group at AIA, summarised the possibilities for mutual partnership and shared insights on how companies across the globe are cutting Life Cycle costs,increasing Productivity, enhancing Functional Safety and ensuring complete Visualisation thru e-Manufacturing. The 21st century is seeing a paradigm shift for Indian Manufacturing industry. Companies looking at local markets are now aiming to be connected with Global markets. "To reach out to newer markets and alliances and business opportunities, company's are faced with the hard fact that unless they improve their return on investments, comply with tough regulatory norms and enhanced safety requirements, they will miss the mark" said Mr J P Singh, President, Automation Industry Association(AIA), while speaking at PharmaTech 2008. PharmaTech 2008, was organised by the Automation Industry Association, to demonstrate to the Indian Pharmaceutical industry about the benefits of leveraging cutting edge automation technologies and responding to the emerging business environment. The symposium brought together leading Automation process & solution providers on a common platform, discussing industry specific challenges of operational excellence, global regulatory and certification requirement, integrated performance management, manufacturing and automation risks and return on assets. The Indian Pharmaceutical market which today stands at fourth largest in terms of volume and thirteenth in terms of value has achieved over 7% growth, making its presence felt in the global market primarily through its focus on global generics markets. With many governments encouraging the shift to generics on the back of rising pressure on healthcare budgets, coupled with a significant number of drugs going off patent, Indian pharma companies are now pursuing aggressive strategies to foray new and under-served markets such as Japan, South Africa, EU and CIS countries and Latin America. The Indian Biotech industry too has crossed US$ 2 billion and is projected to be US$ 5 billion by year 2010. While automation started and progressed slowly in Pharmaceutical Industry, it has come to play an increasingly important role in keeping the industry moving ahead. "Pharma companies are likely to take different steps forward as they reshape their strategies and infrastructure to prepare for future developments, but the starting point has to be the vision of where the company wants to be in 10 to 15 years time and how this will impact manufacturing methods and practices' said Mr Venkat Jasti, Chairman Pharmexcil & VC CEO Suven Life Sciences Limited. "Companies which earlier were competing with each other with stand-alone equipment, lower production costs, and a market scenario where markets were defined by products are now looking at a new era in manufacturing. Competition is today in terms of value chains, with a lot more emphasis on time and delivery cost to market. Manufacturing firms have to look at a scenario where they have to sense the customers need and respond immediately. Integrated automation in this situation has become a must rather than a mere requirement" added Mr Singh. Operational effectiveness, profit pressures require manufacturing to contribute and the industry has to work together to enable a compliant manufacturing environment that delivers product to plan with minimal cost and risk. The role of automation technologies is thus crucial in facilitating processes that enable measurement and control, ensure optimum efficiency and increase productivity. Automation is also the key in maintaining consistency & quality and conforming to safety, environmental and a host of other stringent regulatory standards. "Automation is required to unlock full value of the Business Chain by connecting plant floor to business system , and connectivity to the business system from R&D, through Clinical trial to Commercial Manufacturing" continued Mr Jasti. Automation enabled global business integration by VENKAT JASTI, Chairman, PHARMEXCIL and VC & CEO, Suven Life Sciences Ltd. Process Analytical Technology (PAT) Guidelines by RAMESH P LALA, Director, Klenzaids Contamination Controls (P) Ltd.
Track and Trace for e-pedigree compliance by ARUN T. DIVAKARAN, Domain Consultant (Pharma Manufacturing), Siemens Information Systems Ltd.
Against the backdrop of The Automotive Mission Plan, AMP 2016, and the emerging synergy amongst all stakeholders, Automation India Association, AIA, hosted this Industry Vertical Summit for the AUTOMOTIVE INDUSTRY. The summit was organized around 3 major themes – Digital Manufacturing, Plant Safety and Reliability, and Manufacturing Execution Systems. AIA’s AutomotiveTech 2007 Summit in Mumbai brought together the Automotive fraternity – OE Manufacturers, allied equipment manufacturers,1st Tier Suppliers, and connected them with the Automation industry experts. Speaking at the inaugural session, JP Singh, President AIA, spoke about the special and exciting role that automation has in manufacturing and infrastructure, which is opening up new career prospects. Pilloo Aga and Ranjan Sen, both representing ACMA highlighted the urgency to look at automation as an enabler for implementing flexible and lean manufacturing systems. Leena Pandey, SIAM, shared the investment climate, stating that 15 billion dollars investments have already been announced, and India is well on the road to becoming a global manufacturing hub. Summarising the seminar theme, Vijay Paranjape, EC member, AIA, invited the delegates to take the discussion forward after the seminar, and form teams so that we can apply global best practices in our automotive assembly and auto component manufacturing plants. “The automation industry is fully committed to support you”, he concluded. 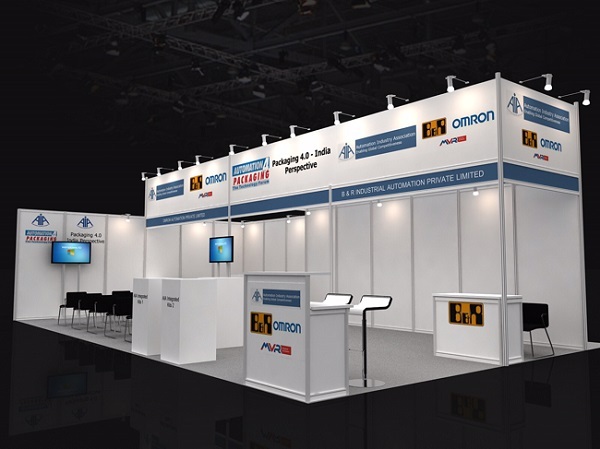 AIA member-companies showcased unique solutions at the 'Automation & Instrumentation India 2007 Exhibition' to facilitate process manufacturing and consumer industries in India become more globally competitive. 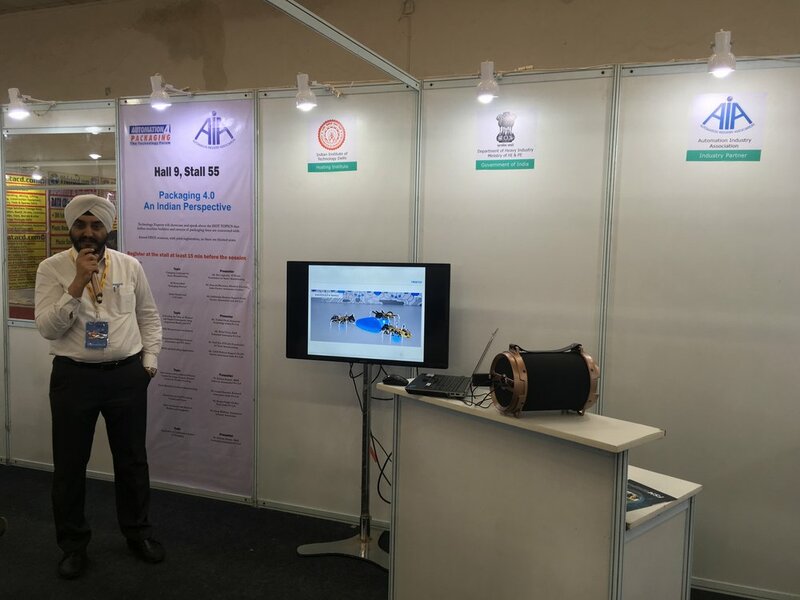 The exhibition organized by the Confederation of Indian Industries (CII) at Pragati Maidan in the Capital, focused on asset management, information integration, quality control, regulatory and safety compliance among other related issues. AIA Director, Anup Wadhwa explored areas of cooperation with ACMA representatives. AIA Founder Member Sunil Khanna spoke about the challenge that auto manufacturers are facing today. Though there are certainly a number of automation and information technology solutions available, the automobile supply chain is still full of hurdles when it comes to passing information from ancillary units to the shop floor. If it takes just 72 hours to actually build and assemble a car in the manufacturer's shop floor why does it take 6 weeks for most cars to get delivered to the show room once the order is placed? Key decision makers from different industries, suppliers of automation systems and enterprise solutions, and other stakeholders such as engineering consultants and policy makers deliberated, discussed, shared experiences, and formulated strategies to succeed in these challenging but opportune times. JP Singh, AIA President outlined the strategy being pursued by AIA.